Top left is NE. Image width is about 58 arc min - Image and text © Anglo-Australian Observatory, Photograph from UK Schmidt plates by David Malin. Many other, much larger nebulae than M42 in Orion are known, but none offers us so intimate a view of a nearby stellar nursery. 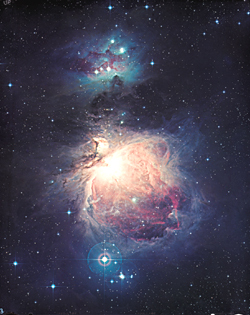 To the eye, the nebula appears as a misty patch around the central star of the line of three which form Orion's sword. Binoculars or a modest telescope will show that these three 'stars' are loose groups of several individuals some of which can be seen in this photograph. The central group of stars, the Trapezium cluster, is hidden in the glow of the Orion Nebula in this photograph, but these stars are responsible for producing the nebula. It is the high concentration of dust and gas in this part of the sky which has resulted in the formation of the stars, so the Orion nebula is no random association of bright stars and dusty gas. At a distance of 1500 light years, the Orion nebula is the nearest star-forming region to the Sun.